My most recent class was a Valentines Day couples class. I have never had a couples painting class before and I just loved how fun it was with the students and their partners! The subject they had to paint was a beautiful watercolor swan. I gave them 2 different blues and a green to mix for their water and they were able to find their own personal color mixture that they used to paint the water. We even used some purple in the shadows on the swan, but for the most part we left the white of the paper show through for the body of the swan except for some shadows from the feathers. Watercolor is so different than any other paint medium in this way because you don't use white paint, you just use the white of the paper instead which I love. I adore how they turned out! Each couple painted their swan in the opposite direction from their spouses swan to form a heart when put together. I love how each painting was different with their own personalities. I definitely want to have more spouses attend my classes together in the future. It is so great for couples to experience creativity together! If you are interested in booking a class here in Akron with your favorite couples email me at taratories@gmail.com and we can set that up! My March art class is now open for registration and I am really excited about it! Click HERE for more information and to sign up! 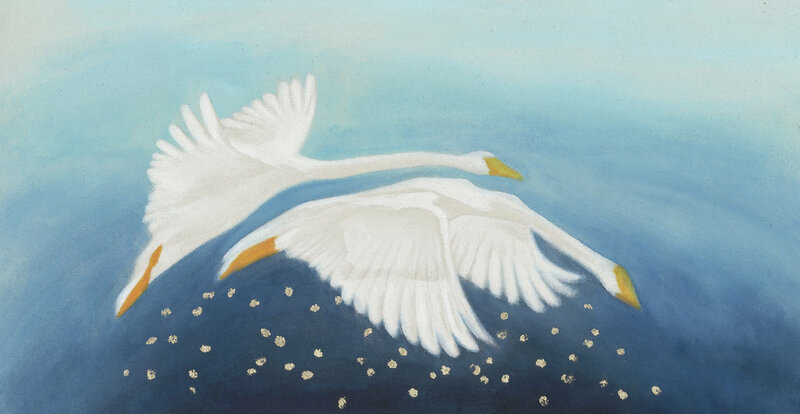 I have this "Flying Swans" painting that I did on my residency in Wales that I am selling prints of. The prints are 24X12 and cost $29 each. I add gold leaf to every print along with a golden signature. The swan print was inspired by my painting entitled "The Green Man's Daughter." This original painting is available for purchase and I am also selling prints of it as well. Print sizes: 11X14- $39 and 18X24- $69. These unique prints also come with gold embellishments. Email me at taratories@gmail.com if you are interested in purchasing any of these prints!